Albert Einstein's work on quantum mechanics is of major importance to information philosophy, because we depend on a limited indeterminism and an "adequate" or statistical determinism to explain the possibilities in an open future needed to create new information. Einstein was in 1916 the discoverer of indeterminism and ontological chance, though he was reluctant to fully accept chance in his final theory. "God Does Not Play Dice!"" We will show that in the two decades preceding the "founding" of quantum mechanics by Niels Bohr, Werner Heisenberg, Max Born, Pascual Jordan, P. A. M. Dirac, Erwin Schrödinger, and Wolfgang Pauli, Einstein discovered ontological chance in quantum physics, without which no new information can be created. Without chance and new information, there can be no "free creations of the human mind," which Einstein correctly recognized as the fundamental source of new scientific theories. Einstein saw a wave randomly "collapse" twenty years before there was a "wave function" and the Schrödinger wave equation. He discovered the existence of indeterministic chance as a "weakness" in quantum theory over a decade before Heisenberg published his indeterminacy principle. Since the validity of any theory rests on its experimental confirmation, as Einstein knew very well, we can say that the extraordinary confirmation of quantum mechanics, especially its probabilistic nature, makes it the best supported theory in the history of science, but nevertheless it is a statistical theory. Paradoxically, ironically perhaps, and even tragically, only a handful of scientists and philosophers recognize the full range of Einstein's contributions, primarily because he disavowed his own quantum discoveries as contrary to his fundamental beliefs about the workings of the universe. Few of us are immune to the power of beliefs that prevent the acceptance of scientifically established facts. As exceptional a scientist as Einstein was, he was no exception there. Randomness was not his only concern, maybe not even his main concern, as we shall see. Quantum mechanics appears to conflict with special relativity, and its nonlocality conflicts with general relativity and Einstein's dream of a "unified field theory." One can give good reasons why reality cannot at all be represented by a continuous field. From the quantum phenomena it appears to follow with certainty that a finite system of finite energy can be completely described by a finite set of numbers (quantum numbers). This does not seem to be in accordance with a continuum theory, and must lead to an attempt to find a purely algebraic theory for the description of reality. But nobody knows how to obtain the basis of such a theory. In principle, continuous field theories contain an infinite amount of information. The differential equations that describe classical physics in space and time assume there are an infinite number of infinitesimal points along any finite line segment. But Einstein saw that any finite volume (even the whole observable universe) can contain only a finite number of discrete quanta of matter or energy. Quantum mechanics can thus be described with simpler difference equations in what Einstein described as an "algebraic" theory. Ludwig Boltzmann had shown that he could derive his entropy law assuming that space can be described as "coarse grained" into small enough discrete volumes, though still large enough to contain many particles. Quite apart from his great deterministic and continuous theories of special and general relativity, Einstein was one of the most important creators (both discoverer and inventor) of the indeterministic and discrete theory of quantum mechanics. In his 1905 paper on the light-quantum hypothesis and photoelectric effect, he quantized the radiation field, where Max Planck had only quantized the energy in his virtual oscillators. Einstein was first to see that electromagnetic radiation is particulate. And in his very next paper he proved the existence of atoms. In that one year he saw both matter and energy as particulate and how they are converted into one another, E = mc2. Einstein thus saw that both the material and the energetic universe have discrete and discontinuous properties! His 1905 paper on Brownian motion predicted sizes and motions for atoms that were confirmed just a few years later. And although he waited ten years to do so, Einstein stated unequivocally that quantum processes are fundamentally indeterministic, a matter of chance. "A weakness in the theory," he called it in 1916. He lamented at that time to his friend Michele Besso that he was the only scientist who believed in the reality of what we now call photons, "I do not doubt anymore the reality of radiation quanta, although I still stand quite alone in this conviction." On a careful reading of his 1905 photoelectric effect paper, we can see that Einstein was already concerned about faster-than-light actions, thirty years before his Einstein-Podolsky-Rosen paper popularized the mysteries and paradoxes of quantum nonlocality and entanglement. We hope to show that many of today's controversies in the interpretations of quantum mechanics can be resolved by seeing these problems through Einstein's eyes. Despite his foundational work quantizing radiation, Einstein rarely gets any credit for his contributions to quantum mechanics. There are a number of important reasons for this, which lead historians of quantum theory to start with Planck's quantum of action, then jump over Einstein's 1905 papers and his 1909 work on wave-particle duality to Niels Bohr's "old quantum theory" of the atom in 1913. Today, Bohr's "quantum jump" of an electron between stationary states is described as emitting or absorbing a "photon" of energy hν. In actuality, Bohr fought against Einstein's light-quantum hypothesis and denied the existence of photons until the mid-1920's. Bohr's work in 1924 with H. A. Kramers and John Slater was the last defense of continuous, as opposed to discrete, radiation. The Bohr-Kramers-Slater theory claimed that energy was not conserved in each matter-radiation interaction, but only statistically. Immediately, Einstein suggested multiple experiments to Walther Bothe that could disprove the BKS claim. In 1925, Bothe and Hans Geiger developed two experiments that disproved the BKS theory. At this point, Bohr finally accepted Einstein's light quanta as real, twenty years after Einstein's insight in his 1905 "miracle year." Besides quantizing light energy and seeing its interchangeability with matter, E = mc2, Einstein was the first scientist to see many of the most fundamental aspects of quantum physics, e.g., nonlocality and instantaneous action-at-a-distance (1905), wave-particle duality (1909), emission and absorption processes that introduce indeterminism and acausality whenever matter and radiation interact (1916-17.) He predicted the stimulated emission of radiation behind today's lasers, the indistinguishability of elementary particles with their strange quantum statistics (1925), and the nonseparability and entanglement of interacting identical particles (1935). Just because Einstein did not regard any of these discoveries as part of a fundamental "local" reality that Einstein wanted is no reason to deny him credit for them all. Einstein's description of wave-particle duality is as good as anything written today. He saw the relation between the wave and the particle as the relation between probable possibilities and the realization of one possibility as an actual event. He saw the wave spreading out in space and giving us the probable number of particles in different locations. Where Einstein saw the particle as concrete and material, he described the wave as a "ghostly field," which is exactly right according to the information interpretation of quantum mechanics. The wave is neither matter nor energy, but pure abstract information about locating concrete matter and energy. The information about probabilities and possibilities in the wave function is immaterial, but that abstract information has real causal powers. 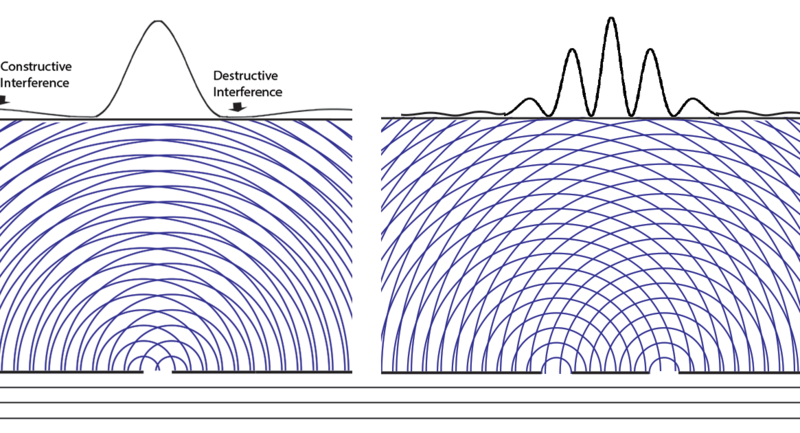 The wave's interference with itself predicts null points where no particles should be found. And experiments confirm that no particles are found there. Immaterial information is a kind of modern "spirit." Einstein also described the wave function as a ""guiding field" (Führungsfeld), an idea taken up later by Louis de Broglie as his "pilot waves." Following de Broglie, Schrödinger developed his equation that describes how the probability wave function moves through space deterministically. This restoration of some determinism was a brief bright moment for Einstein. He saw a possible return to a deterministic theory for quantum mechanics and his continuous field theory. But it was not to be, despite the large number of present-day physicists who are still pursuing Einstein's and Schrödinger's deterministic dreams, by denying indeterminism and "quantum jumping." The linearity of the Schrödinger wave equation produces the mysterious superposition of states and the projection postulate - the wave function "collapse." In a linear equation, the sum of two solutions is also a solution. Although the projection postulate is basically a formalization of Einstein's 1916 transition probabilities from an excited state to more than one lower state, although he had been first to see a light wave collapse into a photon that could eject an electron in his 1905 photoelectric effect paper, and although he had been first to proclaim ontological chance as a part of the quantum theory, it must have been a disappointment to Einstein to find that the determinism in Schrödinger's wave equation could only determine his probabilities, that ontological chance is still real. Einstein could never accept most of his quantum discoveries because they conflicted with his basic idea that nature is best described by a continuous field theory using differential equations that are functions of "local" variables, primarily the space-time four-vector of his general relativistic theory. Einstein's idea of a "local" reality is one where "action-at-a-distance" is limited to causal effects that propagate at or below the speed of light, according to his theory of relativity. Einstein believed that quantum theory, as good as it is (and he never saw anything better), is "incomplete." This is so, because its statistical predictions (phenomenally accurate in the limit of large numbers of identical experiments - "ensembles" Einstein called them), tell us nothing but "probabilities" about individual systems. Even worse, he saw that the wave functions of entangled two-particle systems predict faster-than-light correlations of properties between events in a space-like separation. He mistakenly thought this violated his theory of relativity. Although this was the heart of his famous EPR paradox paper in 1935, we shall see that Einstein was already concerned about faster-than-light transfer of energy and that he saw spherical light waves "collapsing" instantaneously in his very first paper on quantum theory. In most general histories, and in the brief histories included in modern quantum mechanics textbooks, the problems raised by Einstein are usually presented as arising after the "founders" of quantum mechanics and their Copenhagen Interpretation in the late 1920's. Modern attention to Einstein's work on quantum physics often starts with the Einstein-Podolsky-Rosen paper of 1935, when the mysteries of nonlocality, nonseparability, and entanglement are first clearly understood by Einstein's opponents. Physicists today think of quantum mechanics as beginning with the Heisenberg (particle) formulation and the Schrödinger (wave) formulation. The popular image of Einstein post-EPR is either in the role of critic trying to expose fundamental flaws in the "new" quantum mechanics or as an old man who simply didn't understand the new quantum theory. Both these images of Einstein are seriously flawed, as we shall see. Many histories of quantum theory, most starting from the Copenhagen perspective of Bohr, Heisenberg, Born, Jordan, and Pauli, focus on Einstein's failed attempts in debates with Bohr to challenge the uncertainty principle. EPR is described as failing to show that quantum mechanics is "incomplete." This is a verbal quibble. Quantum mechanics is indeed incomplete in that it cannot predict simultaneously the position and momentum of a particle, nor the "real" path of a particle between measurements. Most important, QM is only a statistical theory, as Einstein maintained. Its results are only confirmed by large numbers of identical experiments. Continuous matter and radiation only appear when we average over large numbers of discrete particles. Here Einstein first argues for a fundamental symmetry between matter and radiation. He does not yet mention E = mc2. That Einstein said in 1906. Einstein sees this here, but does not say so explicitly until 1927. In particular, the photoelectric effect showed discontinuous discrete light quanta absorbed by single electrons, though it was doubted until the discovery of the Compton Effect in 1923. Thermodynamically, radiation behaves like gas particles. Light cannot be spread out continuously in all directions if the energy is absorbed as a unit that ejects a photoelectron in the photoelectric effect. The usual conception, that the energy of light is continuously distributed over the space through which it propagates, encounters very serious difficulties when one attempts to explain the photoelectric phenomena, as has been pointed out in Herr Lenard's pioneering paper. Why did Bohr not see in 1913, or Einstein point out to him, that when a jumping electron in an atom absorbs or emits energy, the energy is a single light quantum particle? He surely knew that was what was happening in the Bohr atom! This equation predicts a linear relationship between the frequency of Einstein's light quantum hν, and the energy E of the ejected electron. It wasn't until ten years later that R. A. Millikan confirmed Einstein's photoelectric equation. Millikan nevertheless denied that it proved Einstein's radical but clairvoyant ideas about light quanta! If the energy travels as a spherical light wave radiated into space in all directions, How can it instantaneously collect itself together to be absorbed into a single electron. Einstein already in 1905 sees something nonlocal about the photon and that there is both a wave aspect and a particle aspect to electromagnetic radiation. He will make those aspects more clear and in 1909 describe the wave-particle relationship more clearly than it is usually presented today, with all the confusion about whether photons and electrons are waves or particles or both. Einstein greatly expanded his light-quantum hypothesis in a presentation at the Salzburg conference in September, 1909. He argued that the interaction of radiation and matter involves elementary processes that are not "invertible," a deep insight into the irreversibility of natural processes. While incoming spherical waves of radiation are mathematically possible, they are not practically achievable. Nature appears to be asymmetric in time. He speculates that the continuous electromagnetic field might be made up of large numbers of light quanta - singular points in a field that superimpose collectively to create the wavelike behavior. Although he could not formulate a mathematical theory that does justice to both the oscillatory and quantum structures - the wave and particle pictures, Einstein argued that they are compatible. This was over a decade before wave mechanics and quantum mechanics. And because gases behave statistically, he knows that the connection between the wave and particles may involve probabilistic behavior. When he finished the years needed to complete his general theory of relativity, Einstein turned back to quantum theory and to Bohr's 1913 postulates about electrons jumping between stationary (non-radiating) states and radiating energy Em - En = hν. Where Bohr's two postulates provided amazingly accurate explanations of the Balmer and Lyman lines in the hydrogen spectrum, Einstein showed how to derive those postulates along with his latest, and so far simplest, derivation of the Planck radiation law. Where Bohr and Planck had manipulated mathematical expressions to correspond with spectroscopic data, Einstein found the statistical probabilities for absorption and emission of light quanta when an electron jumps between discrete energy states, showing his deep physical understanding of interactions between electrons and radiation, going back over ten years. He predicted the existence of "stimulated emission" and showed quantum theory is the source of ontological chance. Einstein derived "transition probabilities" for quantum jumps, described as A and B coefficients for the processes of absorption, spontaneous emission, and (his newly predicted) stimulated emission of radiation. In two papers, "Emission and Absorption of Radiation in Quantum Theory," and "On the Quantum Theory of Radiation," he again derived the Planck law (for Planck it was mostly a guess at the formula needed to fit spectroscopic observations), he derived Planck's postulate E = hν, and he derived Bohr's second postulate Em - En = hν. Einstein did this by exploiting the obvious relationship between the Maxwell-Boltzmann distribution of gas particle velocities and the distribution of radiation in Planck's law. The "statistical interpretation" of Max Born tells us the outgoing wave is the probability amplitude wave function Ψ, whose absolute square is the probability of finding a light particle in an arbitrary direction, as Einstein qualitatively knew well but never published. An outgoing light particle must impart momentum hν/c to the atom or molecule, but the direction of the momentum can not be predicted! Neither can the theory predict the time when the light quantum will be emitted. Einstein called this weakness by its German name - Zufall (chance). Einstein may not have liked this conceptual crisis, but his insights into the indeterminism involved in quantizing matter and energy were known, if largely ignored, for another decade until Heisenberg's quantum theory introduced his famous uncertainty principle in 1927. Heisenberg states that the exact position and momentum of an atomic particle can only be known within certain (sic) limits. The product of the position error and the momentum error is greater than or equal to Planck's constant h/2π. In his two papers on quantum mechanics in 1916-17, Einstein's discovery of ontological chance is the most important contribution to physics and philosophy. But his insight into the asymmetry of the emission and absorption processes may be used to discover the origin of irreversibility and an explanation for Boltzmann's hypothesis of "molecular disorder." When a molecule absorbs or emits the energy ε in the form of radiation during the transition between quantum theoretically possible states, then this elementary process can be viewed either as a completely or partially directed one in space, or also as a symmetrical (nondirected) one. It turns out that we arrive at a theory that is free of contradictions, only if we interpret those elementary processes as completely directed processes. The elementary process of the emission and absorption of radiation is asymmetric, because the process is directed, as Einstein had explicitly noted first in 1909, and we know he had seen as early as 1905. The apparent isotropy of the emission of radiation is only what Einstein called "pseudo-isotropy" (Pseudoisotropie), a consequence of time averages over large numbers of events. Einstein often substitutes time averages for space averages, or averages over the possible states of a system in statistical mechanics. a quantum theory free from contradictions can only be obtained if the emission process, just as absorption, is assumed to be directional. In that case, for each elementary emission process Zm->Zn a momentum of magnitude (εm—εn)/c is transferred to the molecule. If the latter is isotropic, we shall have to assume that all directions of emission are equally probable. If the molecule is not isotropic, we arrive at the same statement if the orientation changes with time in accordance with the laws of chance. Moreover, such an assumption will also have to be made about the statistical laws for absorption, (B) and (B'). Otherwise the constants Bmn and Bnm would have to depend on the direction, and this can be avoided by making the assumption of isotropy or pseudo-isotropy (using time averages). Now the principle of microscopic reversibility is a fundamental assumption of statistical mechanics. It underlies the principle of "detailed balancing," which is critical to the understanding of chemical reactions. In thermodynamic equilibrium, the number of forward reactions is exactly balanced by the number of reverse reactions. But microscopic reversibility, while true in the sense of averages over time, should not be confused with the reversibility of individual collisions between molecules. The equations of classical dynamics are reversible in time. And the deterministic Schrödinger equation of motion in quantum mechanics is also time reversible. Irreversibility thus depends on the "projection" of a superposition of states into a single state, the so-called "collapse" of the wave function. In 1924, Einstein received an amazing very short paper from India by Satyendra Nath Bose. Einstein must have been pleased to read the title, "Planck's Law and the Hypothesis of Light Quanta." It was more attention to Einstein's 1905 work than anyone had paid in nearly twenty years. The paper began by claiming that the "phase space" (a combination of 3-dimensional coordinate space and 3-dimensional momentum space) should be divided into small volumes of h3, the cube of Planck's constant. By counting the number of possible distributions of light quanta over these cells, Bose claimed he could calculate the entropy and all other thermodynamic properties of the radiation. Bose easily derived the inverse exponential function, Einstein too had derived this. Maxwell and Boltzmann derived it, without the additional -1, by analogy from the Gaussian exponential tail of probability and the theory of errors. (Planck had simply guessed this expression from Wien's law by adding the term - 1 in the denominator of Wien's a / e - bν / T). without using classical radiation laws, a correspondence principle, or even Wien's law. His derivation was purely statistical mechanical, based only on the number of cells in phase space and the number of ways N photons can be distributed among them. Einstein immediately translated the Bose paper into German and had it published in Zeitschrift für Physik, without even telling Bose. More importantly, Einstein then went on to discuss a new quantum statistics that predicted low-temperature condensation of any particles with integer values of the spin. So called Bose-Einstein statistics were quickly shown by Dirac to lead to the quantum statistics of half-integer spin particles called Fermi-Dirac statistics. Fermions are half-integer spin particles that obey Pauli's exclusion principle so a maximum of two particles, with opposite spins, can be found in the fundamental h3 volume of phase space identified by Bose. Einstein's 1916 work on transition probabilities predicted the stimulated emission of radiation that brought us lasers (light amplification by the stimulated emission of radiation). Now his work on quantum statistics brought us the Bose-Einstein condensation. Either work would have made their discoverer a giant in physics, but these are more often attributed to Bose, just as Einstein's quantum discoveries before the Copenhagen Interpretation are mostly forgotten by historians and today's textbooks, or attributed to others. This may have been Einstein's last positive contribution to quantum physics. Some judge his next efforts as purely negative attempts to discredit quantum mechanics, by graphically illustrating quantum phenomena that seem logically impossible or at least in violation of fundamental theories like his relativity. But information philosophy hopes to provide explanations for Einstein's paradoxes that depend on the immaterial nature of information. The phenomena of nonlocality, nonseparability, and entanglement may not be made intuitive by our explanations, but they can be made understandable. And they can be visualized in a way that Einstein and Schrödinger might have liked, even if they would still find the phenomena impossible to believe. We hope even the layperson will see our animations as providing them an understanding of what quantum mechanics is doing in the microscopic world. The animations present standard quantum physics as Einstein saw it, though Schrödinger never accepted the "collapse" of the wave function and the existence of particles. Sadly, despite Einstein's two decades of pioneering work on the interaction of photons and electrons, his ideas and concerns were given little attention at this Solvay, though the conference was dedicated to electrons and photons. The conference was dominated by papers on the new quantum theory delivered by Louis de Broglie, Niels Bohr, Max Born and Werner Heisenberg. It is best known for Einstein's after-hours suggestions to Niels Bohr and Werner Heisenberg probing for faults in the uncertainty principle. Accounts of these events have been told largely by the victors (there are no holes in uncertainty) but Einstein has said they often missed or ignored his important point. That point was the nonlocal behavior of a spherical light wave as it collapses to get absorbed by a single electron. This was Einstein's only contribution mentioned in the published proceedings. Here are the notes on Einstein's original remarks at the conference and Bohr's brief response. They contain much of Einstein's 1935 EPR paper, except in 1927 only one particle is involved. Entanglement in EPR requires two identical particles. Notice how Einstein's diagram clearly shows his concerns of over two decades about reconciling a spherical wave (his example is now an electron) and its collapse to being measured at just one point as if it is a particle. At this point in the history of quantum mechanics, wave-particle duality is seen as the debate between Schrödinger's wave mechanics and Heisenberg's particle mechanics. Let S be a screen provided with a small opening O, and P a hemispherical photographic film of large radius. Electrons impinge on S in the direction of the arrows. Some of these go through O, and because of the smallness of O and the speed of the particles, are dispersed uniformly over the directions of the hemisphere, and act on the film. The waves give the probability or possibilities for a single electron being found at different locations in an ensemble of identical experiments. A wave does not describe a cloud of electrons as Schrödinger had hoped. Einstein's ensemble theory is the correct interpretation. Quantum theory is not complete in this sense. Representing each particle as a narrow wave packet aiming at the point P is mistaken. If by the same particle, Einstein means that the one individual particle has a possibility of being found at more than one (indeed many) locations on the screen. This is so, but this seems to be conception I? In my opinion, one can remove this objection only in the following way, that one does not describe the process solely by the Schrödinger wave, but that at the same time one localises the particle during the propagation. I think that Mr de Broglie is right to search in this direction. If one works solely with the Schrödinger waves, interpretation II of | ψ |2 implies to my mind a contradiction with the postulate of relativity. Bohr's reaction to Einstein's presentation has been preserved. He didn't understand a word! He disingenuously claims he does not know what quantum mechanics is. His response is vague and ends with his ideas on complementarity and the inability to describe a causal spacetime reality. Does Bohr really not understand? As we have seen, Einstein has been making this general point for many years. Only recently has Bohr taken Einstein's concept of light quanta seriously. Twenty-two years later, in his contribution to the Schilpp memorial volume on Einstein, Bohr had no better response to Einstein's 1927 concerns. But he does remember vividly and provides a picture of what Einstein drew on the blackboard. Note that they wanted Einstein's reaction to their work, but actually took little interest in Einstein's concern about the nonlocal implications of quantum mechanics, nor did they look at his work on electrons and photons. The idea that the light wave (or wave function) gives the probabilities of finding a particle was seen by Einstein decades earlier, though he never published his idea of a ghost field (Gespensterfeld). Einstein is too modest. Einstein sees that nonlocality may be unavoidable. On the other hand, it seems to me certain that we have to give up the notion of an absolute localization of the particles in a theoretical model. This seems to me to be the correct theoretical interpretation of Heisenberg's indeterminacy relation. And yet a theory may perfectly well exist, which is in a genuine sense an atomistic one (and not merely on the basis of a particular interpretation), in which there is no localizing of the particles in a mathematical model. For example, in order to include the atomistic character of electricity, the field equations only need to involve that a three-dimensional volume of space on whose boundary the electrical density vanishes everywhere, contains a total electrical charge of an integral amount. Thus in a continuum theory, the atomistic character could be satisfactorily expressed by integral propositions without localizing the particles which constitute the atomistic system. Only if this sort of representation of the atomistic structure be obtained could I regard the quantum problem within the framework of a continuum theory as solved. Einstein and colleagues Boris Podolsky and Nathan Rosen, proposed in 1935 a paradox (known by their initials as EPR or as the Einstein-Podolsy-Rosen paradox) to exhibit internal contradictions in the new quantum physics. They hoped to show that quantum theory could not describe certain intuitive "elements of reality" and thus was incomplete. They said that, as far as it goes, quantum mechanics is correct, just not "complete." Einstein was correct that quantum theory is "incomplete" relative to classical physics, which has twice as many dynamical variables that can be known with arbitrary precision. But half of this information is missing in quantum physics, due to the indeterminacy principle which allows only one of each pair of non-commuting observables (for example momentum or position) to be known with arbitrary accuracy. Even more important, an individual particle, cannot be said to have a known position before a measurement, since evolution described by the unitary and deterministic Schrödinger equation provides us only probabilities. The most that can be said is that the particle can be found anywhere the probability amplitude is non-zero. This was the core idea of Einstein's claim of "incompleteness." For Bohr to deny this and call quantum mechanics "complete" was just to play word games, which infuriated Einstein. Einstein was also correct that indeterminacy makes quantum theory an irreducibly discontinuous and statistical theory. Its predictions and highly accurate experimental results are statistical in that they depend on an ensemble of identical experiments, not on any individual experiment. Einstein wanted physics to be a continuous field theory, in which all physical variables are completely and locally determined by the four-dimensional field of space-time in his theory of relativity. Einstein and his colleagues Erwin Schrödinger, Max Planck, (later David Bohm), and others hoped for a return to deterministic physics, and the elimination of mysterious quantum phenomena like the superposition of states, the mysterious "collapse" of the wave function, and Schrödinger's famous cat. EPR continues to fascinate determinist philosophers of science who hope to prove that quantum indeterminacy does not exist. What happens according to the information interpretation of quantum mechanics is an instantaneous change in the information about probabilities (actually complex probability amplitudes). Nothing physical (matter or energy) is moving anywhere. But Einstein was also bothered by what is known as "nonlocality," as we saw at the 1927 Solvay conference. This mysterious phenomenon was even more clearly exhibited in EPR experiments as the apparent transfer of something physical faster than the speed of light. Einstein may have already seen this inconsistency with his relativity theory in his 1905 papers. Most accounts of entanglement and nonlocality begin with the idea that distinguishable particles separate - particle 1 goes one way and particle 2 the other. But indistinguishable particles cannot be separated. And neither one has a distinct path between measurements. After the particles are measured and become entangled at t1, quantum mechanics describes them with a single two-particle wave function that is not the product of two one-particle wave functions. Because electrons are indistinguishable particles, it is not proper to say electron 1 goes this way and electron 2 that way. (Nevertheless, it is convenient to label the particles, as we do in illustrations below.) It is misleading to think that specific particles have distinguishable paths. Einstein said correctly that at a later time t2, a measurement of one electron's position would instantly establish the position of the other electron - without measuring it explicitly. And this is correct, just as after the collision of two billiard balls, measurement of one ball tells us exactly where the other one is due to conservation of momentum. But this is not "action at a distance." It is more nearly "knowledge at a distance." Note that Einstein used conservation of linear momentum to calculate the position of the second electron. Although conservation laws are rarely cited as the explanation, they are the physical reason that entangled particles always produce correlated results. If the results were not always correlated, the implied violation of a fundamental conservation law would be a much bigger story than mysterious entanglement itself, as interesting as that is. This idea of something measured in one place "influencing" measurements far away challenged what Einstein thought of as "local reality." It came to be known as "nonlocality." Einstein called it "spukhaft Fernwirkung" or "spooky action at a distance." Schrödinger described the two electrons as "entangled" (verschränkt) at their first measurement. Verschränkt means something like cross-linked. It describes someone standing with arms crossed. Today EPR is the classic example of entanglement. Einstein criticized the collapse of the wave function as "instantaneous-action-at-a-distance." This criticism resembles the criticisms of Newton's theory of gravitation. Newton's opponents charged that his theory was "action at a distance" and instantaneous. Einstein's own field theory of general relativity shows that gravitational influences travel at the speed of light and are mediated by a gravitational field that shows up as curved space-time. For Einstein, fields like gravitation and electromagnetism are ponderable, a disturbance of the field at one place is propagated at some finite velocity to other parts of the field. But mathematical probability is not a ponderable field in this sense. When a probability function collapses to unity in one place and zero elsewhere, nothing physical, neither matter nor energy, is moving from one place to the other. Only information changes. Schrödinger said that his "Wave Mechanics" provided more "visualizability" (Anschaulichkeit) than the "damned quantum jumps" of the Copenhagen school, as he called them. He was right. We can use the wave function to visualize EPR. But we must focus on the probability amplitude wave function of the prepared two-particle state. We must not attempt to describe the paths or locations of independent particles - at least until after some measurement has been made. We must also keep in mind the conservation laws that Einstein used to describe nonlocal behavior in the first place. Then we can see that the "mystery" of nonlocality for two particles is primarily the same mystery as the single-particle collapse of the wave function. But there is an extra mystery, one we might call an "enigma," that results from the nonseparability of identical indistinguishable particles. In the time evolution of an entangled two-particle state according to the Schrödinger equation, we can visualize it - as we visualize the single-particle wave function - as collapsing when a measurement is made. The discontinuous "jump" is also described as the "reduction of the wave packet." This is apt in the two-particle case, where the superposition of | + - > and | - + > states is "projected" or "reduced: to one of these states, and then further reduced to the product of independent one-particle states. In the two-particle case (instead of just one particle making an appearance), when either particle is measured we know instantly those now determinate properties of the other particle that satisfy the conservation laws, including its location equidistant from, but on the opposite side of, the source. Here is an animation that illustrates the unprovable assumption that the two electrons are randomly produced in a spin-up and a spin-down state, and that they remain in those states no matter how far they separate, provided neither interacts until the measurement. An interaction does what is described as decohering the two states. Nonlocality and entanglement are thus just another manifestation of Richard Feynman's "only" mystery. In both single-particle and two-particle cases paradoxes appear only when we attempt to describe independent particles following a path to measurement by observer A (and/or observer B). Is it remotely possible that Einstein deliberately added an asymmetry to a problem that he knew is symmetric, in order to get physicists thinking more seriously about the questions he had been raising for decades, with no one ever taking them. or him, seriously? Why Did Einstein De-emphasize Symmetry and Conservation Principles? The experiment with two entangled particles was introduced by Einstein in the 1935 EPR paradox paper. The Copenhagen assumption that each particle is in a random unknown combination of spin up and spin down, independent of the other particle, simply because we have not yet measured either particle, is wrong and the source of the “paradox.” Just as a particle has an unknown but definite position, entangled particles have definite spins, even if they are unknown individually, they are interdependent jointly. Why did Einstein not say, that when the particles travel away from the central source, with total spin zero, one is at all times spin up, the other is spin down? The operative principle for Einstein here is conservation of spin. To assume that their spins are independent is to consider the absurd outcome that spins could be found both up (or down), a violation of a conservation principle that is much more egregious than the amazing fact spins are always perfectly correlated in any measurements. Why also did Einstein not say that the overall problem is symmetric. It thus makes no sense to say that one particle is measured first, the other second, if they are in a space-like separation. In some other moving reference frames it will be the other particle that is measured first. 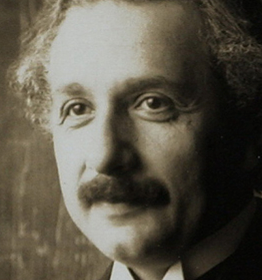 Is Einstein setting a trap for lesser thinkers? Einstein's dream of a continuous and deterministic unified field theory as a "theory of everything" gets in the way of his accepting the nonlocal and nonseparable, indeterministic and asymmetric character of radiation interactions with matter in quantum theory. Despite his reputation as the major critic of quantum mechanics, Einstein came to accept its indeterminism and statistical nature. As we have seen, he had himself discovered these aspects of quantum mechanics. If it is merely constructed on data derived from experience, he said quantum mechanics can only be approximate. Einstein always hoped to discover - or invent - a more fundamental theory, preferably a field theory like the work of Newton and Maxwell and his own relativity theories. He dreamed of a single theory that would unite the gravitational field, the electromagnetic field, the “spinor field,” and even what he called the “ghost field” or “guiding field” of quantum mechanics. Such a theory would use partial differential equations that predict field values continuously for all space and time. That theory would be a free invention of the human mind. Pure thought, he said, could comprehend the real, as the ancients dreamed. Einstein wanted a field theory based on absolute principles such as the constant velocity of light, the conservation laws for energy and momentum, Ehrenfest’s adiabatic principle, symmetry principles, or Boltzmann’s principle that the entropy of a system depends on the possible distributions of its components. We can now see the elements of Einstein’s interpretation, because fields are not substantial, like particles. They are abstract immaterial information that predicts the behavior of a particle at a given point in space and time, should one be there! Fields are information. Particles are information structures. A gravitational field describes paths in curved space that moving particles follow. An electromagnetic field describes the forces felt by an electric charge at each point. The wave function Ψ of quantum mechanics - we can think of it as a possibility field - provides probabilities that a particle will be found at a given point. In all three cases continuous immaterial information describes causal influences over discrete material objects. Note that the local values of all these fields depend on the distribution of matter in the rest of space, the so-called “boundary conditions.” Curvature of space depends on the distribution of masses. Electric fields depend on the distribution of charges. And quantum possibility fields depend on whether there are one or two slits open in the famous and mysterious experiment. The quantum possibility field, calculated from the deterministically evolving Schrödinger equation, is a property of space. Like all fields, it exists whether or not there is a particle present. It only depends on the particle through the particle's wavelength. Following Einstein's objective reality view that particles have paths even if they cannot be measured, we can now animate the above cases of one slit open or two. Note that with two slits open, the paths start from one slit or the other, distributing themselves randomly between the interference fringes. We can now summarize Einstein’s thinking about field theories, resulting in a new interpretation of quantum mechanics. 1. Individual particles have the usual classical properties, like position and momentum, plus uniquely quantum properties, like spin, but these properties can only be established statistically. The quantum theory gives us statistical information about an individual particle position, probable values of all possible properties. A particle like an electron is a compact information structure with a definite position and momentum, even if it is unknown. 2. The quantum wave functions are fields. Einstein called them ghost fields or guiding fields. The fields are not the particles. The fields have values in many places at the same time. Particles are at one place at a time. Quantum field values are complex numbers which allow interference effects, causing some places to have no particles. Fields are not localized. Einstein showed that a particle of matter or energy is always localized. Light quanta are emitted and absorbed only as units, for example when one ejects an electron in the photoelectric effect. 3. Because quantum physics does not give us precise information about a particle’s location, it is incomplete when compared to classical physics. Quantum mechanics is a statistical theory and contains only probable information about an individual particle. 4. The Copenhagen notion of complementarity, that a quantum object is both a particle and a wave, or sometimes one and sometimes the other, depending on the measurements performed, is confusing and simply wrong. A particle is always a particle and the wave behavior of its probability field is simply one of the particle’s properties, like its mass, charge, spin, etc. 5. While the probability wave field is abstract and immaterial information, it causally influences the matter or energy, just as the particle’s spin dramatically alters its statistical properties, in particular its allowed positions, as Einstein showed in his 1924 discovery of quantum statistics. These nonintuitive behaviors are simply impossible in classical physics. 6. Although Niels Bohr deserves credit for arranging atoms in the periodic table, the deep reasons for two particles in the first shell and eight in the second were only clear after Einstein discovered spin statistics in 1924, following a suggestion by S. N. Bose. 7. In the two-slit experiment, Einstein’s localized particle always goes through one slit or the other, but when the two slits are open the probability wave function, which influences where the particle can land, is different from the wave function when one slit is open. The possibilities field (a wave) is determined by the boundary conditions of the experiment, which are different when only one slit is open. The particle does not go through both slits. It does not “interfere with itself.” It is never in two places at the same time. 8. The experiment with two entangled particles was introduced by Einstein in the 1935 EPR paradox paper. The Copenhagen assumption that each particle is in a random unknown combination of spin up and spin down, independent of the other particle, simply because we have not yet measured either particle, is wrong and the source of the “paradox.” Just as a particle has an unknown but definite position, entangled particles have definite spins, even if they are unknown individually, they are interdependent jointly. When the particles travel away from the central source, with total spin zero, one is at all times spin up, the other is spin down. The operative principle for Einstein is conservation of spin. To assume that their spins are independent is to consider the absurd outcome that spins could be found both up (or down), a violation of a conservation principle that is much more egregious than the amazing fact spins are always perfectly correlated in any measurements. 9. Erwin Schródinger explained to Einstein in 1936 that two entangled particles share a single wave function that can not be separated into the product of two single-particle wave functions, at least not until there is an interaction with another system that decoheres their perfect correlation. 10. Einstein ultimately accepted the indeterminism in quantum mechanics and the uncertainty in conjugate variables, despite the clumsy attempt by his colleagues Podolsky and Rosen to challenge uncertainty and restore determinism in the EPR paper. 11. In 1931 Einstein called P.A.M.Dirac’s transformation theory “the most perfect exposition, logically, of this [quantum] theory” even though it lacks “enough information to enable one to decide” a particle’s exact properties. In 1933 Dirac reformulated quantum physics using a Lagrangian rather than the standard Hamiltonian representation. The time integral of the Lagrangian has the dimensions of action, the same as Planck’s quantum of action h. And the principle of least action visualizes the solution of dynamical equations like Hamilton’s as exploring all paths to find that path with minimum action. Dirac’s work led Richard Feynman to invent the path-integral formulation of quantum mechanics. The transactional interpretations of John Cramer and Ruth Kastner have a similar view. The basic idea of exploring all paths is in many ways equivalent to saying that the probabilities of various paths are determined by a solution of the wave equation using the boundary conditions of the experiment. As we saw above, such solutions involve whether one or two slits are open, leading directly to the predicted interference patterns, given only the wavelength of the particle. 12. In the end, of course, Einstein held out for a continuous field theory, one that could not be established on the basis of any number of empirical facts about measuring particles, but must be based on the discovery of principles, logically simple mathematical conditions which determine the field with differential equations. His lifelong dream was a “unified field theory,” one that at least combined the gravitational field and electromagnetic field, and one that might provide an underpinning for quantum mechanics someday. Einstein was clear that even if his unified field theory was to be deterministic and causal, the statistical indeterminism of quantum mechanics itself would have to be preserved. This seemingly impossible requirement is easily met if we confine the determinism to Einstein’s continuous field theories, which are pure abstract immaterial information. Einstein’s discovery of indeterminism and the statistical nature of physics we apply only to particles, which are information structures, new information in the universe created by the rearrangement of matter, while subject to the second law of thermodynamics. Perhaps the major reason for historians of quantum mechanics (writing since the Copenhagen Interpretation) to largely ignore Einstein is that he was the single most important critic of the quantum mechanics formulated in the late 1920's by Niels Bohr, Werner Heisenberg, Max Born, Pascual Jordan, Wolfgang Pauli, and Paul DIrac, whose work became the "standard orthodox" interpretation of quantum mechanics. So Einstein today is remembered more for his later attacks than for his truly extraordinary fundamental contributions to quantum theory before its so-called "founding.". Einstein's major objection was that quantum mechanics is a statistical theory, one that predicts probable results for a large number of experiments, but nothing about specific events, like the exact time of a radioactive decay or the direction of spontaneous emission of a photon. This "chance" behavior of individual systems was something that Einstein himself had pointed out in his early papers. But without the ability to predict individual events with certainty, he maintained that quantum mechanics must remain an incomplete theory. Quantum mechanics can precisely specify fewer physical variables than classical mechanics. Because of the indeterminacy principle, only one of each pair of non-commuting observables (momentum or position, for example) can be specified precisely. In this sense, classical theory is more complete. It contains more information. But rather than simply accept Einstein's description and terminology, Bohr, Heisenberg and others engaged in linguistic debates, claiming that quantum theory is itself "complete." They simply denied that more could be known about an underlying reality. A second concern for Einstein was that the wave function ψ for an isolated free particle evolves in time to occupy all space. All positions become equally probable. Yet when we observe the particle, it is always located at some particular place. This does not prove that the particle had a particular place before the observation, but Einstein had a commitment to "elements of reality" that he thought no one could doubt. One of those elements is a particle's position. He asked the question, "Does the particle have a precise position the moment before it is measured?" The Copenhagen answer was sometimes "no," more often it was "we don't know." A third (and related) problem for Einstein was the appearance of "nonlocal" behavior, in the "collapse" of the wave function, in the two-slit experiment, and in the EPR experiment "entangling" two particles. Einstein thought in 1927 at the Solvay conference that nonlocality violated his theory of special relativity. He drew a diagram on the blackboard illustrating the problem for a single particle. When the particle appears at point P on the right, what becomes of the wave that was going off to the left? Its "collapse" appears to violate his relativity principle. All the modern collapse-deniers (Bohm, Everett, Zeh, Zurek) are following Einstein and Schrödinger, thinking that the wave function might be something tangible and real. Beyond nonlocality, but closely connected, a fourth problem was the nonseparability of indistinguishable particles. It was the centerpiece of his 1935 criticisms of quantum theory. Already in 1927 Einstein expressed concerns about wave functions that describe two particles. He said that two configurations of a system that are distinguished only by the permutation of two particles of the same species are represented by two different points (in configuration space), which is not in accord with his new results in quantum gas statistics. For an animated visualization of a "nonlocal" and "nonseparable" two-particle wave function collapse, see our EPR page. A two-particle wave function cannot be the product of independent wave functions for the two components, not even if the partial systems are found to be spatially separated from each other at the moment when they are measured. They had no determinate positions (they were indistinguishable and inseparable) just before the measurements. Einstein thought something must be traveling faster than light speed. That something is only abstract information about probability. When Einstein published the EPR paper in 1935, it was thirty years since he first had seen the conflict between quantization and relativity. Virtually no other physicists have seen this as clearly as Einstein, and much of the confusion and mystery surrounding entanglement and nonlocality is reduced to the one single mystery (as Richard Feynman described it) of quantum mechanics, the superposition of states and collapse of the wave function, whether a single-particle or two-particle wave function! A fifth difficulty arose from Einstein's deep belief that any physical theory must be based on a continuous field. For Einstein, physical objects must be described by continuous functions of field variables in four-dimensional space-time coordinates. In quantum field theory (QFT), particles are functions of (singularities in) these fields. In quantum electrodynamics (QED), fields are merely properties of aggregated particles. Which then are the more fundamental? It appears to be particles, especially today when the last fundamental particle predicted by the standard theory (the Higgs boson) has been found. Einstein knew that his dream of a unified field theory may not be possible. In 1949 he asked about the theoretical foundation of physics in the future, "Will it be a field theory [or] will it be a statistical theory?" Heisenberg and Bohr did not require a "conscious observer" to collapse the wave function in a measurement, but only the connection to the observer's mind for the results of an experiment to become human knowledge. A sixth objection was the "Copenhagen interpretation" of the measurement process as requiring a conscious "observer" to produce "collapses" of the wave function. Einstein thought it absurd that his bed would diffuse throughout his bedroom until the moment that he opened the door and looked at it. It is not human observation that collapses wave functions, but any interaction of one quantum system with another. Focusing on information created or destroyed in particle interactions solves the famous "measurement problem." A related objection was Bohr's philosophical commitment to "complementarity," which Einstein compared to Kant's dualistic subjective-objective and phenomenal-noumenal thinking. Einstein said he could not understand complementarity "despite much effort which I have expended on it." Rather than directly answer, indeed accept, Einstein's claims that quantum theory is statistical and therefore incomplete, Bohr amateurishly philosophized about "complementary" classical and quantum realities. There is only one quantum reality, which converges in the limit of large numbers of particles (whether radiation or matter) to appear "classical" and adequately determined for most practical purposes. To summarize, Einstein disagreed initially with the fundamental indeterminism and statistical character of quantum theory. Inspired by his Spinozan deterministic theory of nature, Einstein repeatedly asserted that "God does not play dice." Ironically, it was Einstein himself who first clearly identified quantum-level indeterminism (over a decade before Heisenberg's discovery of uncertainty and acausality). Einstein saw that the decay time of a radioactive nucleus and the direction of a spontaneously emitted photon are nothing but the consequence of "chance" (Zufall) in quantum theory. On the other hand, his determinism did not prevent Einstein from saying that physical concepts and the laws of nature are "free creations of the human mind." Einstein's magnificent contributions to quantum theory are not only such "free creations," but "chance" is half of the best explanation for the existence of human creativity and freedom of the will from pre-determinism. The adequate determinism of macroscopic structures (like human beings) is the other half of the two-stage model of free will. Although it was Max Planck who introduced the notion of quantization (in 1900) to develop his blackbody radiation law, Planck did not believe for many years that radiation itself was quantized. It was Einstein who introduced the light quantum hypothesis, in 1905. Planck did not accept Einstein's light quanta for several years. He said in the discussion period following Einstein's 1909 paper, "That seems to me to be a step that, in my opinion, is not yet called for." Bohr opposed light quanta for two decades after Einstein's hypothesis, and rarely gave him much credit thereafter. In 1913, Neils Bohr's "old quantum theory" introduced stationary eigenstates in his "Bohr atom," but he continued to believe that the radiation emitted in "quantum jumps" between those states is continuous and classical until the middle 1920's. Bohr postulated that the radiation emitted or absorbed was given by the formula E = hν, but it was Planck who first proposed this relation and Einstein who derived (proved) this result (in 1916). Bohr did not accept the reality of light quanta (photons) until after the failure of his Bohr-Kramers-Slater attempt to combine discontinuous electron jumps with continuous radiation emission in 1924. As early as 1921, Einstein spoke to several colleagues about the wave as an immaterial "ghost field" (Gespensterfeld) that predicts the probability of finding his light quanta and as a leading or pilot field (Führungsfeld) that guides the paths of the energy quanta. In 1924, Louis deBroglie predicted the wave theory of matter. It was based on Einstein's writings on wave-particle duality fifteen years earlier and perhaps on Einstein's speculations about a pilot field. Einstein was an enthusiastic supporter of deBroglie's wave theory. It brought the symmetry and equivalence between matter and radiation that Einstein asked for in his earliest works. In 1926, Erwin Schrödinger developed his wave equation and "wave mechanics," which he showed could produce exactly the same results as Heisenberg-Jordan-Born "matrix mechanics" (and considerably simplify calculations, to Heisenberg's embarrassment). Schrödinger said he was inspired by Einstein's "short but infinitely far-seeing remarks" into the wave and particle theories of radiation. Also in 1926, Max Born offered his "statistical interpretation" of the wave function for a scattered particle. Einstein's picture of the quantum theory of radiation had interpreted the wave picture as the density of the statistical distribution of photons. Following the Einstein precedent that waves predicted the probabilities or number of light quanta (later photons), Born described deBroglie-Schrödinger matter waves as predicting the probabilities for different paths in atom and electron collision processes. Few commentators, give Einstein credit for the statistical interpretation, presumably because Einstein was so critical of it. Born himself wrote Einstein, that he got "my idea, to conceive of the Schrödinger wave field as a ghost field in your sense," viz., Einstein's "Gespensterfeld". For Einstein, Born's work on material particles (which mirrored Einstein's own light quanta insights) confirmed quantum theory as an incomplete statistical theory. Schrödinger violently disagreed with Born's statistical view. He even denied the reality of "quantum jumps," as did later followers of Einstein and Schrödinger like David Bohm, John Wheeler, John Bell, Hugh Everett, H. Dieter Zeh, Wojciech Zurek, and many other "collapse-deniers" to this day. In 1927, Werner Heisenberg announced his indeterminacy principle and claimed that nature was acausal. But Einstein first found that chance was the only possible explanation for the spontaneous emission of radiation and the spontaneous decay of radioactive nuclei (again in 1916). Einstein saw acausality in nature a decade before Heisenberg. To be sure, such "chance" bothered Einstein. He called it a "weakness in the theory." But he still deserves some credit for seeing the discrete, discontinuous, and acausal nature of quantum physics long before those who do get the credit. At the Solvay conference in 1927, Bohr and Heisenberg claimed that Einstein suggested a number of thought experiments to disprove Heisenberg's indeterminacy principle. Heisenberg said that Bohr defended the principle successfully again and again. And at Solvay Einstein made perfectly clear his concern that faster-than-light effects might be involved as the probability wave of quantum mechanics collapsed instantly when the particle is discovered at a particular location. Did Einstein already see this as early as 1905 (when he enunciated his principle of relativity)? There he wondered how energy in a light wave spread out into a large volume of space could get itself all together again to be absorbed by another atom. Eight years later, Einstein made his most famous attack on the statistical and incomplete nature of quantum mechanics with two Princeton colleagues, Boris Podolsky and Nathan Rosen. The Einstein-Podolsky-Rosen paper, and a Schrödinger paper (on his famous cat) the same year, made famous the concepts of "nonlocality," "nonseparability," and "entanglement" that are so popular today with some scientists and many philosophers of science who dislike the irreducible statistical and indeterministic aspects of quantum theory. |ψ|2 must represent the probability density for electrons (or other particles). the idea of electron waves was familiar to me when Schrödinger's papers on the structure of simple atoms appeared. At that time it was clear that the proper interpretation of quantum mechanics must be of a statistical type. There were several attempts to formulate this, all based on matrix mechanics, by Heisenberg, Bohr, Kramers, and others. I do not remember when and how the idea struck me that collision processes, i.e. aperiodic motions, must provide the clue for the solution; for the relative numbers of the incoming and outgoing particles could be counted and regarded as empirical probability values. I think this must have been already in my mind when I was at M.I.T. and tried, together with Norbert Wiener, to find a formulation of quantum mechanics for aperiodic motions. As soon as I had digested Schrödinger's papers I saw the right way to approach this, guided by a remark of Einstein's about the meaning of intensity of light (i.e. of an electromagnetic wave) in terms of photons: this intensity must represent the number of photons; but the latter was of course to be understood statistically, as the average over a certain photon distribution. Einstein had considered in depth the statistical nature of this distribution, particularly the fluctuations about the mean, which are closely connected with Planck's radiation formula. These investigations were well known to me, and they led immediately to the conjecture that the intensity of the de Broglie wave, i.e. the (absolute) square of Schrödinger's wave function, must be regarded as the probability density, which is the probability of finding a particle in a unit of volume. Long before the best known arguments for quantum mechanics by Heisenberg, Born, Jordan and others in the late nineteen-twenties, Einstein had followed Max Planck's postulate of a "quantum of action" (for Planck this was just a mathematical device applied to hypothetical resonant oscillators needed to derive his radiation law) to the conclusion that electromagnetic radiation consists of discrete particles of light (Einstein called them "lichtquant") that are emitted and absorbed as indivisible units. As matter is composed of atomic units, Einstein argued that energy itself is also quantized and can be emitted and absorbed only in whole units. Planck in 1900 explained the spectral distribution of colors (wavelengths) in blackbody electromagnetic radiation by using Boltzmann’s principle that the entropy S of a gas is related to the probabilities W for random distribution of molecules in different places in its container (S = k logW, where k is Boltzmann’s constant). Boltzmann’s calculations of probabilities used the number of ways that particles can be distributed in various volumes of space. Planck used the same combinatorial analysis, but now for the number of ways that discrete elements of energy could be distributed among a number of radiation oscillators. ρν = (8πhν3/c3) / (ehν/kT - 1). Planck's "blackbody" radiation law was the first known connection between the mechanical laws of matter and the laws of electromagnetic energy. Planck realized that he had made a great step in physical understanding, "the greatest discovery in physics since Newton," he reportedly told his seven-year-old son in 1900. In particular, Planck found that Boltzmann's statistical mechanics constant k = R/N, derived from the distribution of velocities of material gas particles, appears in his new law for the distribution of electromagnetic radiation energy. Planck established an independent and very accurate value for Boltzmann's constant (he gave it the symbol k). His blackbody radiation distribution law of course also includes the new Planck constant h (the "quantum of action"). Planck also found a value for Avogadro's number of molecules in a mole (gram molecular weight) of a gas. This experimental agreement greatly impressed Einstein. Einstein was impressed with the experimental accuracy of the Planck radiation law. But beyond that, Einstein was very interested in the interaction between radiation and matter that Planck had now probed. Five years later, Einstein published three famous papers, all exploring the interaction between radiation and matter. He showed that there are fundamental similarities between light and material particles. Best known is his theory of special relativity (connecting energy and matter - as did Planck - but now with the famous equation E = mc2), his theory of Brownian motion, and his explanation of the photoelectric effect (for which he was awarded the Nobel Prize). But in this third paper, Einstein proposed that electromagnetic radiation really consists of discrete quantities of light (he called them lichtquant, light quanta, today they are called photons). Einstein added physical significance to Planck's equation for radiant energy, E = hν, where h is Planck’s constant and ν is the frequency of the radiation. Einstein also derived the blackbody radiation law. His assumptions were more physical, where Planck's were heuristic guesses chosen to fit the data. And Einstein saw the profound physical implications of assuming that both matter and radiation come in discrete particles or quanta (an idea that Einstein pointed out went back to Newton, before Maxwell's theory of electromagnetism introduced the concept of continuous fields - which Einstein made the basis of all his future work in general relativity). Boltzmann had made the laws of physics merely statistical laws. Where Planck did not accept the reality of quanta until some years after Einstein's work, Einstein was alone among physicists believing in the reality of light quanta and, at least in his early work, believing in the statistical nature of physics, even if he decried it as a "weakness in the theory." When in 1913 Neils Bohr published his work on the quantization of energy levels in atoms (the so-called "old" quantum theory), he did not imagine that the discrete transitions - "quantum jumps" - between energy levels involved quantized light particles. Bohr thought the electron jumps between "orbits" were quantum and discontinuous, but he thought the radiation emitted was discrete, Em - En= hν, a classical and continuous wave going out in all directions. Einstein may not have liked this conceptual crisis, but his insights into the indeterminism involved in quantizing matter and energy were known, if largely ignored, over a decade before Heisenberg's quantum theory introduced his famous uncertainty principle in 1927. Heisenberg states that the exact position and momentum of an atomic particle can only be known within certain (sic) limits. The product of the position error and the momentum error is greater than or equal to Planck's constant h/2π. Indeterminacy (Unbestimmtheit) was Heisenberg's original name for his principle. It is a better name than the more popular uncertainty, which connotes lack of knowledge. Quantum indeterminacy is ontological as well as epistemic lack of information. We cannot - and here is where the causal law breaks down - explain why a particular atom will decay at one moment and not the next, or what causes it to emit an electron in this direction rather than that. Heisenberg (and Bohr) were not convinced about Einstein's light quanta as late as 1926! Whether or not I should believe in light quanta, I cannot say at this stage. Radiation quite obviously involves the discontinuous elements to which you refer as light quanta. On the other hand, there is a continuous element, which appears, for instance, in interference phenomena, and which is much more simply described by the wave theory of light. But you are of course quite right to ask whether quantum mechanics has anything new to say on these terribly difficult problems. I believe that we may at least hope that it will one day. The weakness of the theory is, on the one hand, that it does not bring us closer to a link-up with the undulation theory; on the other hand, it also leaves time of occurrence and direction of the elementary processes a matter of "chance." Nevertheless, I fully trust in the reliability of the road taken. Although Einstein initially was a strong critic of quantum theory and its implications for indeterminism and a statistical nature of reality, from the 1930's on he never said that quantum mechanics is "incorrect" - as far as it goes - only that something else would likely be added to quantum physics in the future, making it "complete." Above all, however, the reader should be convinced that I fully recognize the very important progress which the statistical quantum theory has brought to theoretical physics. Einstein endorses the statistical quantum theory as correct. It explains the wave-particle duality he called for in 1909. It is a complete theory, up to the indeterminacy relation. Any future theory will probably incorporate this quantum theory. In the field of mechanical problems — i.e., wherever it is possible to consider the interaction of structures and of their parts with sufficient accuracy by postulating a potential energy between material points — [the quantum theory] even now presents a system which, in its closed character, correctly describes the empirical relations between statable phenomena as they were theoretically to be expected. This theory is until now the only one which unites the corpuscular and undulatory dual character of matter in a logically satisfactory fashion; and the (testable) relations, which are contained in it, are, within the natural limits fixed by the indeterminacy-relation, complete. The formal relations which are given in this theory — i.e., its entire mathematical formalism — will probably have to be contained, in the form of logical inferences, in every useful future theory. As early as 1930, Einstein marveled at the logical strength of the quantum theory, especially its formulation by Paul Dirac, "to whom, in my opinion, we owe the most perfect exposition, logically, of this [quantum] theory." Note that Einstein's views about quantum mechanics in 1949 were essentially unchanged from his views in 1930, and his basic concerns about particles acting like waves and thus violating his theory of relativity go back to 1909 or even 1905. See Einstein's explanation of how continuous field theories came to be a part of our description of reality - alongside material particles - as a result of Maxwell's equations - in the 1931 article "Maxwell's Influence on the Evolution of the Idea of Physical Reality." "I tend more and more to the opinion that one cannot come further with a continuum theory." Physics is an attempt conceptually to grasp reality as it is thought independently of its being observed. In this sense one speaks of "physical reality." In pre-quantum physics there was no doubt as to how this was to be understood. In Newton's theory reality was determined by a material point in space and time; in Maxwell's theory, by the field in space and time. In quantum mechanics it is not so easily seen. If one asks: does a ψ-function of the quantum theory represent a real factual situation in the same sense in which this is the case of a material system of points or of an electromagnetic field, one hesitates to reply with a simple "yes" or "no"; why? What the ψ-function (at a definite time) asserts, is this: What is the probability for finding a definite physical magnitude q (or p) in a definitely given interval, if I measure it at time t? The probability is here to be viewed as an empirically determinable, and therefore certainly as a "real" quantity which I may determine if I create the same ψ-function very often and perform a q-measurement each time. Does the individual system have this q-value before the measurement, or only after it randomly jumps into a position from somewhere else? But what about the single measured value of q? Did the respective individual system have this q-value even before the measurement? To this question there is no definite answer within the framework of the [existing] theory, since the measurement is a process which implies a finite disturbance of the system from the outside; it would therefore be thinkable that the system obtains a definite numerical value for q (or p), i.e., the measured numerical value, only through the measurement itself. For the further discussion I shall assume two physicists, A and B, who represent a different conception with reference to the real situation as described by the ψ-function. A. The individual system (before the measurement) has a definite value of q (i.e., p) for all variables of the system, and more specifically, that value which is determined by a measurement of this variable. Proceeding from this conception, he will state: The ψ-function is no exhaustive description of the real situation of the system but an incomplete description; it expresses only what we know on the basis of former measurements concerning the system. B. The individual system (before the measurement) has no definite value of q (i.e., p). The value of the measurement only arises in cooperation with the unique probability which is given to it in view of the ψ-function only through the act of measurement itself. Proceeding from this conception, he will (or, at least, he may) state: the ψ-function is an exhaustive description of the real situation of the system. "Spatial separation" is not the problem. It is whether the two particles in ψ12 are still coherently "entangled." If they are still entangled, a measurement of ψ12 can find either of the two indistinguishable particles anywhere ψ12 has a non-zero value. There is to be a system which at the time t of our observation consists of two partial systems S1 and S2, which at this time are spatially separated and (in the sense of the classical physics) are without significant reciprocity. The total system is to be completely described through a known ψ-function ψ12 in the sense of quantum mechanics. All quantum theoreticians now agree upon the following: If I make a complete measurement of S1, I get from the results of the measurement and from ψ12 an entirely definite ψ-function ψ2 of the system S2. The character of ψ2 then depends upon what kind of measurement I undertake on S1. Now it appears to me that one may speak of the real factual situation of the partial system S2. Of this real factual situation, we know to begin with, before the measurement of S1, even less than we know of a system described by the ψ-function. As Schrödinger made clear to Einstein in 1935, they are only separated if they have become disentangled, by some interaction with the environment, for example. If ψ12 has decohered, it can then be represented by the product of independent ψ-functions ψ1 * ψ2, and then what Einstein says about independent systems S1 and S2 would be entirely correct. If now the physicists, A and B, accept this consideration as valid, then B will have to give up his position that the ψ-function constitutes a complete description of a real factual situation. For in this case it would be impossible that two different types of ψ-functions could be co-ordinated with the identical factual situation of S2. It is my opinion that the contemporary quantum theory by means of certain definitely laid down basic concepts, which on the whole have been taken over from classical mechanics, constitutes an optimum formulation of the connections. I believe, however, that this theory offers no useful point of departure for future development. This is the point at which my expectation departs most widely from that of contemporary physicists. They are convinced that it is impossible to account for the essential aspects of quantum phenomena (apparently discontinuous and temporally not determined changes of the situation of a system, and at the same time corpuscular and undulatory qualities of the elementary bodies of energy) by means of a theory which describes the real state of things [objects] by continuous functions of space for which differential equations are valid. They are also of the opinion that in this way one can not understand the atomic structure of matter and of radiation. They rather expect that systems of differential equations, which could come under consideration for such a theory, in any case would have no solutions which would be regular (free from singularity) everywhere in four-dimensional space. Above everything else, however, they believe that the apparently discontinuous character of elementary events can be described only by means of an essentially statistical theory, in which the discontinuous changes of the systems are taken into account by way of the continuous changes of the probabilities of the possible states. All of these remarks seem to me to be quite impressive. However, the question which is really determinative appears to me to be as follows: What can be attempted with some hope of success in view of the present situation of physical theory? At this point it is the experiences with the theory of gravitation which determine my expectations. These equations give, from my point of view, more warrant for the expectation to assert something precise than all other equations of physics. One may, for example, call on Maxwell's equations of empty space by way of comparison. These are formulations which coincide with the experiences of infinitely weak electro-magnetic fields. This empirical origin already determines their linear form; it has, however, already been emphasized above that the true laws can not be linear. Such linear laws fulfill the superposition-principle for their solutions, but contain no assertions concerning the interaction of elementary bodies. The true laws can not be linear nor can they be derived from such. I have learned something else from the theory of gravitation: No ever so inclusive collection of empirical facts can ever lead to the setting up of such complicated equations. A theory can be tested by experience, but there is no way from experience to the setting up of a theory. Equations of such complexity as are the equations of the gravitational field can be found only through the discovery of a logically simple mathematical condition which determines the equations completely or [at least] almost completely. "I consider it quite possible that physics cannot be based on the field concept, i.e:, on continuous structures. In that case, nothing remains of my entire castle in the air, gravitation theory included, [and of] the rest of modern physics." "Über einen die Erzeugung und Verwandlung des Lichtes betreffenden heuristischen Gesichtspunkt," Annalen der Physik, vol.17, p.133 (PDF). "On the Quantum Theory of Radiation," Sources of Quantum Mechanics, B. L. van der Waerden, Dover, 1967, pp.63-77 (PDF); Physikalische Zeitschrift, 18, pp.121–128, 1917, Vol.6 of Einstein Collected Papers, pp.220-233. A continuum - "to give up the continuous... is to breath in airless space"
Particles of matter As opposed to singularities in a space-time field, though his 1905 Brownian motion analysis shows how we can observe them. Nonlocality - the [insubstantial] probability that a particle is at x goes to zero instantly when the particle is found at y. Chance (Zufall, Unbestimmtheit) Die Welt ist alles, was der Fall (mit Zufall) ist. Statistical theories - they are "incomplete." Quantum theory - the best theory so far - is incomplete and unsatisfactory as the ultimate theory, which should describe individual quantum systems. Does the particle have a position before it is measured? Bohr's epistemological notion that all we have is "knowledge" but there is no objective quantum-level reality. Did Bohr deny the "reality of the quantum?" Did he make chance and the statistical interpretation of quantum mechanics merely epistemological? 1916-17 analysis of absorption and emission showed that the interaction of light and matter is statistical and indeterministic long before Heisenberg's indeterminacy. The elementary process of emission and absorption is not invertible. Einstein's radiation asymmetry. No incoming spherical waves. Cf. Wheeler-Feynman Absorber Theory. Light emission is random - pure chance when or which way - no spherical waves. 1923 spin statistics (with Bose). “Against Measurement" In Sixty-Two Years of Uncertainty, ed. Arthur Miller, 1990. “‘Nicht sein kann was nicht sein darf,’ or the Prehistory of EPR, 1909-1935: Einstein’s Early Worries about the Quantum Mechanics of Composite Systems.” In Sixty-Two Years of Uncertainty, ed. Arthur Miller, 1990. “Einstein on Locality and Separability.” Studies in History and Philosophy of Science 16 (1985), 171-201. "Einstein and the Quantum:Fifty Years of Struggle,"